Hello i am Balaaj and today I will talk about our last tennis session in Room 3. Today we did volleys, we hit the ball to our partner and they hit it back to us without the ball bouncing. So as you would probably know about the ningbo coming over to see what it is like at New Zealand. In term 2 week 5 we had our third lesson on solar power with the ningbo primary school in this lesson we were recreating our boxes from the design that we drew with our groups. when we finally had all the materials we started to try and remake our design with a cardboard box here are some examples. Room 3 has been writing about solar power on google slides with our group that we did the solar power project with. This term, students have the wonderful opportunity to get involved in folk dancing every Friday! 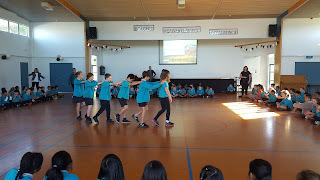 Folk dancing is a great way for the students to come together and enjoy music and dance. Typically, folk dancing reflects the life of people from a certain country or culture. The year 5 and 6 students had their first session at it last week. Here are some photos and videos from the day! So on week 4 Monday, room 3 went around the school measuring simple machines around target road school. If you do not know these simple machines that we were discovering as well as taking photos i will tell you right now: Inclined plane and a example of that is a ramp,Next is the screw now pretty much every where has a screw, i mean come on you will have had to have seen a screw in your life man (or woman).Wedge a example of that is a crowbar.Pulley, a example of that is a crane Next up is the lever and the example of that is a door handle and last but not least is the.... WHEEL & AXLE! The final example is a car. So what we did was Miss Clampitt (our teacher) put us into group and in our groups we went around taking photos and writing down in our books what we were taking pictures of. Hi, I am Balaaj and today i will be talking about Tennis Session 2.
and then hit the ball. We also learnt how to serve, we throw the ball up into the air and then we hit it. If you were confused, look at this photo. Here are some photos of Room 3 enjoying tennis!